We’re just hours away from the NHL regular season starting up for another year, and to Toronto Maple Leafs fans, the moments before opening night puck drop are probably some of the most optimistic between now and June. Fans will be fans, and as they should be, Leafs Nation seems to be optimistic and excited. While I personally strive to maintain a positive outlook and attitude on life in general, I feel like I need to pour some cold water on the collective heads of Leafs fans everywhere, and bring them back to the harsh reality that is the Toronto Maple Leafs. Don’t get me wrong, I’d love to see Toronto Maple Leafs break their Stanley Cup drought this year, but it’s not going to happen. So here it goes, three reasons why the Toronto Maple Leafs are destined for failure in 2015. Coach Carlyle is quite possibly the biggest x-factor in how the team preforms this season. Can Randy hold his star players accountable, and more importantly, will Carlyle reduce their ice-time if they’re not playing a complete game? Last season Carlyle leaned heavily on his top six forwards and top four d-men, which could explain why they were so burnout down the stretch last year. Will Randy be more diligent in monitoring the ice-time of players like Phaneuf, giving them more of an opportunity to succeed? While the opening night roster is seemingly different, credit to Brandon Kozun and Stuart Percy, there’s still a sense that Randy will revert to his old habits. Randy Carlyle implies that Colton Orr and Frazer McLaren could return to Leafs at some point. Says they’re gone now but could be back. Do the Maple Leafs already have Carlyle’s successor in Steve Spott? Carlyle will never admit to it, but he must be feeling pressure. 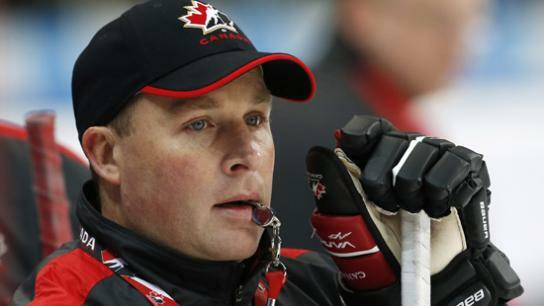 Former assistant coaches, Dave Ferrish, Scott Gordon, and Greg Cronin, were all replaced despite Carlyle’s desire to keep them. Replaced by Steve Spott and Peter Horacheck, Carlyle must see the writing on the wall. If he can’t get the Leafs to play a fundamentally different style of game, one that focuses more on limiting turnovers and scoring chances against, there are two potential successors (with early indications that Spott is the preferred candidate) to replace Carlyle behind the bench. You know when you’ve got that item in your fridge that is technically past the expiry date, but you give it the sniff test to see if it’s still good? Well plain and simple, this Leafs team doesn’t pass the sniff test. Just watch them play and you can see the glaring flaws. As a team, the Maple Leafs had a -231 giveaway/takeaway differential in 2013/2014. Key members from the core of this team (Kessel, Kadri, Phaneuf, Gardiner) finished with combined 127 turnovers. Through 8 games in the pre-season, the Leafs essentially played the exact same type of inconsistent hockey as last year; glaring turnovers, awful play inside their own defensive zone, and a dependency on their goalies to bail them out. They were often outplayed and outworked, and even though the Maple Leafs finished with a record of 5-2-1, they gave up an average of 28.1 shots against. Now to the Leafs credit, they averaged 35.9 shots against last season, so through 8 pre-season games they’ve definitely improved in that regard. But can a group that tends to think offense first sustain the current defensive mindset? Despite the improvement, the Leafs were badly outshot Buffalo & Ottawa, and that should be a concern. Sure its only the pre-season, but bad habits can be hard to break, and right now the Leafs are reverting to some of the bad habits that cost the team a playoff spot last year. There’s a saying that coaches and managers like to use when it comes to assessing the pre-season, and that is “throw the baby out with the bathwater”. For the most part I subscribe to that theory, but sometimes the proverbial baby gets thrown out instead of the bathwater. My concern is that the Maple Leafs will win while playing bad hockey, thus keeping the same flawed style we saw last season (aka the bathwater), instead of adopting a more team-oriented game that focuses on long-term success (aka the baby). Every single hockey team is made up with a variety of personalities and player types. Look at all 30 teams in the NHL and you’ll find a similarity in the rosters; a mix of star players, muckers and grinders, and the tweeners (the group of guys who are not quite good enough to elevate their game to a level of stardom, but who are too skilled and useful to be relegated to a 5minutes a night or less kind of role). Now on the successful teams, each one of those clicks finds a way to co-exist and keep each other accountable. There’s nothing saying they have to be the best of friends, but in order to be successful as a team, the group has to at the very least respect the collective group effort, goals, and standards. The good teams overcome those hurdles and find a way to win. And then there’s the Toronto Maple Leafs. A team made up of stars with massive egos, overvalued and often overpaid pluggers, and stopgap players who are on the roster simply to fill a void. Now this isn’t necessarily a terrible mix of player personalities, but it is one that, in order to be successful long-term, relies on a strong authoritative figure at the helm to hold the group accountable and keep them in check. One would presume that this is the role of Coach Carlyle, but frankly Randy has acted more like “one of the boys” instead of taking on the authoritative role. The division between players in the locker-room, and the lack of accountability from top to bottom has already become evident via a very telling quote from Phil Kessel in training camp. We all know the star players get to cut some corners here and there, but have you ever heard Jonathan Toews, Sidney Crosby, or Ryan Getzlaf admit to that publicly? Not a chance, they never would, because they know a statement like that can lead to a potentially mutinous divide amongst the group. Again, for a team to win a championship they don’t have to like each other, but when there’s a complete lack of accountability and uniformity amongst the group, the probability of winning becomes significantly lower, and the possibility of a rift developing between the group increases. But don’t worry Leafs fans, if you believe in “The Curse of Frank Mahovlich”, it’s just two more short years until the 50-year spell is supposedly over, and the Leafs can hoist Lord Stanley’s mug again!